I feel like I’m as busy as I have been in a long time, what with a full-time job, a weekly column at JewishBoston.com, and a teething 7-month-old who is already standing and seems to be on her way to walking any moment now. (I can barely take the time to write this for fear she’s discovered some part of the house we haven’t yet gotten to baby-proofing.) 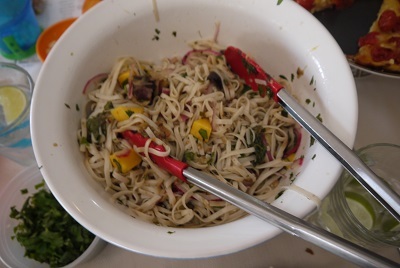 And yet, even though I have zero time these days (even to call people back or email them in a timely fashion; sorry about that, and you know who you are) I have found the time to make these noodles which take well over an hour to prepare, and then need a good two hours of marinating. I passed over this recipe at least a half dozen times in the past year, laughing at how long it took and how many steps there were to it, but then last week, when I miraculously had all the ingredients in the house, I decided to go for it. And my goodness, the outcome was so glorious, I found myself making them AGAIN less than a week later. It’s an Ottolenghi recipe, from his vegetarian cookbook Plenty, so you know it’s a keeper. I’m reminded of a few winters ago when I had his first cookbook out of the library and I found myself grating — by hand, no less, because I’d lost the stem of my food processor — raw rutabaga and celery root for a slaw. A slaw so good, I made it twice in less than a week. Do you see a pattern here? These noodles defy a good description except to say they are extraordinary. 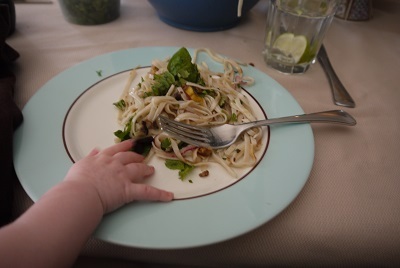 When I served them to my sister-in-law last week, she emailed me the next day because she’d been thinking about the noodles. It honestly wasn’t such a strange email to receive; I’d been thinking about them, too. Brief note: The first time I made this dish I used the soba noodles as suggested, but when I went back to Ocean State Job Lot they had run out of soba, and all that was left were udon and somen. All you want for this dish is a cold buckwheat noodle; any type will do. As for the frying oil, I just used the canola I had on hand. This recipe makes a ton of noodles. I ended up breaking down the noodles into four or five Tupperware containers that Rich and I took for work lunches for almost an entire week. Heat up the sunflower oil in a large pan and shallow-fry the eggplant in three or four batches. Once golden brown, remove to a colander, sprinkle liberally with salt and leave there to drain. 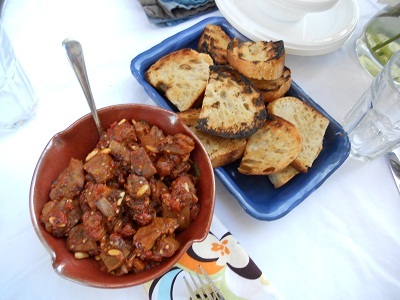 Today’s recipe doesn’t come with a story, just a warning: If you make this eggplant caponata this weekend for a barbeque, or maybe a picnic, or maybe even a college reunion get-together, people will flock to you. You’ll be surrounded, inundated by compliments. It can get embarrassing, and I just want to give you fair warning. You’ll start getting e-mails from people you didn’t even know you’d met at the party. 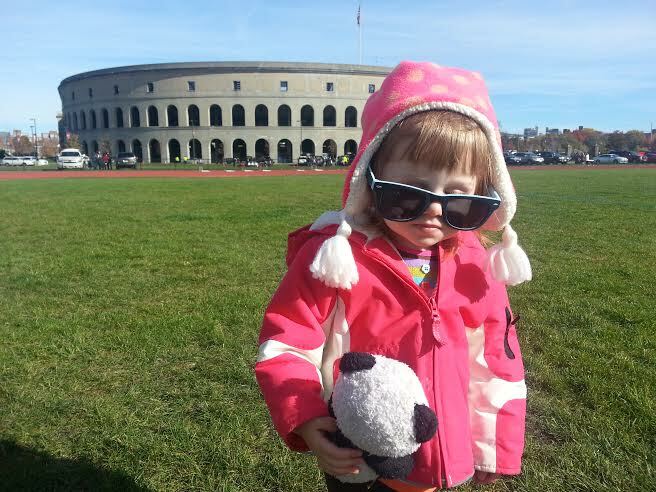 Maybe they’ll find you through Facebook, maybe they’ll look you up in a Student Directory or Google you. I don’t know how they’re going to find you, but they will. At a certain point, you’ll just keep this recipe on your desktop, or just embed it into your email so you can just send it out without thinking about it. With great power comes great responsibility, and I feel I’d be setting you up without the warning. I have Mario Batali to thank for this recipe. 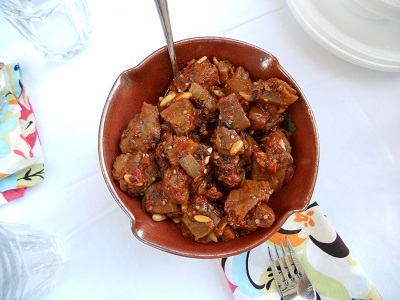 It’s his take on the Sicilian eggplant classic caponata. He makes his with an entire tablespoon of hot red pepper flakes, which is much too much for most people. I usually stick to a teaspoon, maybe a second if I’m feeling bold. The last time I made the dish, I accidentally made it with the tablespoon, but saved it by melting about 1/3 cup of chocolate chips into a hot spot in the pan. The chocolate danced perfectly with the cocoa and cinnamon; if you’re curious, I say go for it. This is one of those dishes whose flavors need to date for a while and get to know each other. If you want to make this for a party on Sunday, I’d suggest making it Saturday, or even Friday night. Like a nice wine or Ray Allen, it just gets better with age. 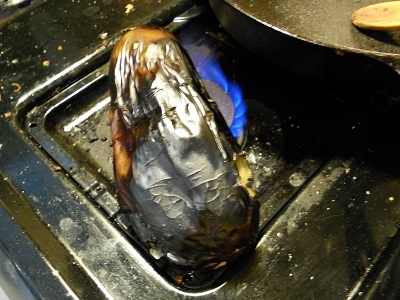 Every time I cook this, I wonder what it would be like if I steamed the eggplant first. If you do end up steaming yours, please let me know how it turned out. I cook it for much longer than Mario suggests, softening things as much as I can. He calls for ¾ cup of basic tomato sauce; I’ve discovered that a box of Pomi marinara sauce works perfectly. In a 10-to-12 inch sauté pan, heat the olive oil over medium-high heat until almost smoking. Add the onion, garlic, pine nuts, currants and red pepper flakes and cook until the onion is softened and translucent, around 15 minutes. Add the eggplant, sugar, cinnamon, and cocoa and cook until the eggplant has softened. Sometimes it takes as much as 20 minutes for it to lose its firmness. Just keep on stirring it to make sure it doesn’t stick and brown. Add the thyme, tomato sauce, and vinegar and bring to a boil. When you bring it to the party, serve it on crostini, or some slices of baguette. I also enjoy tossing it with some pasta and making it into a meal. I think I was frying eggplant in my dream, but curry will do nicely. Last night I dreamed about eggplant. When I do remember my dreams, I like to check the online dream dictionaries so I don’t spend my morning thinking things like, “What on earth does a bicycle (or an eggplant) appearing in my dream mean?” For some inexplicable reason, none of my go-to dream interpretation websites offered an answer. Eggs, yes. Plants, yes. But no eggplant. (OK, I’m not really shocked there isn’t an interpretation for dreaming about eggplant, but I can’t be the only one! Can I?) My own interpretation of my night of nightshade leans towards me falling asleep while trying to figure out what to do with the eggplant sitting in my fridge right now. Eggplants are .79/lb. at Russo’s this week. Cook that up with some rice or quinoa on the side, we’re all set for dinner and some lunches, too. I’m on the fence about salting, which is said to prevent a prickly bitterness on the tongue. I used to be fanatical about it, but I didn’t the last two times I cooked eggplant, and I thought it was fine. 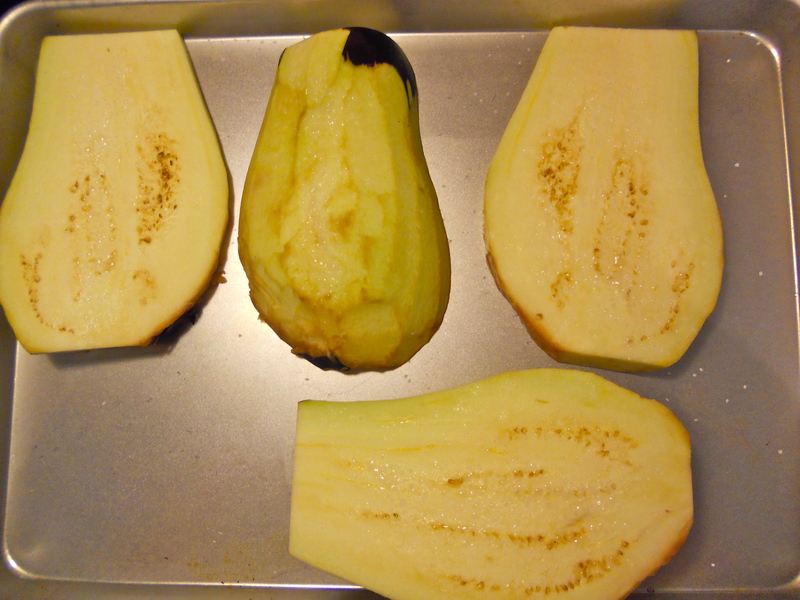 Nonetheless, this is how I prepare my eggplant for salting: First I peel it, then slice the eggplant into fourths. I put it on a baking pan and sprinkle it with kosher salt. 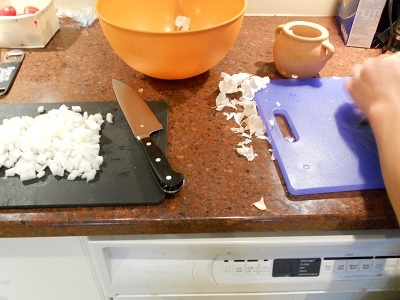 I wait about 20 minutes, and in the meanwhile, do things like chop up onion and get out my spices. After 20 minutes, I return to my eggplant, which now looks like it has spent the last 20 minutes on the elliptical at the gym as the salt has sweated out a lot of the bitterness to the top of its flesh. This has also made my vegetable less watery and less able to soak up oil. Some people suggest running the eggplant under the faucet to get the salt off. I lean towards wiping it down with a wet paper towel. Now your eggplant is good to go. 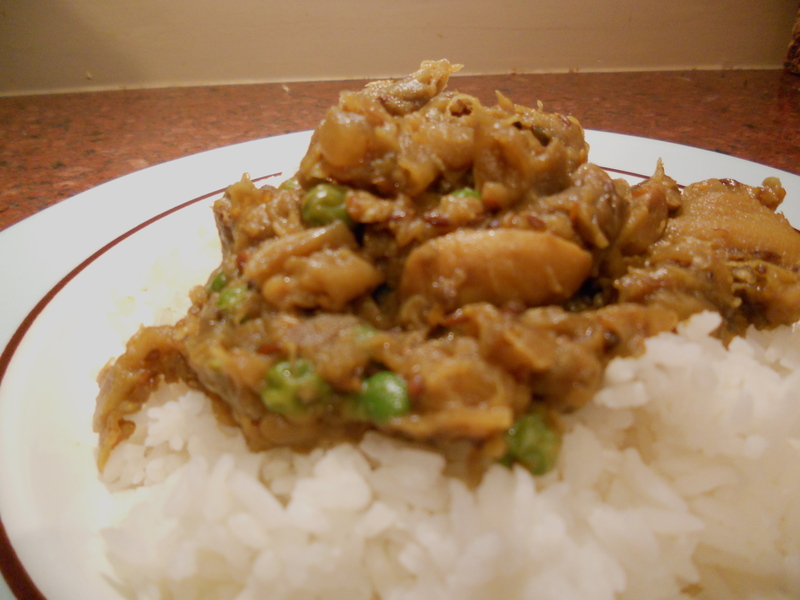 I’m a little embarrassed that my first recipe for my blog is a curry. I feel like I am being lazy somehow. Copping out: Oh, a vegetarian blog featuring a curry? What’s next, chickpeas and sprouts? 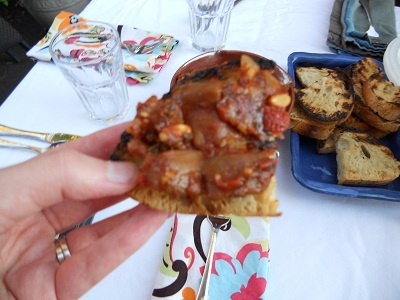 But the truth of the matter is, this is my go-to recipe when I have an eggplant and just can’t think straight anymore. If you’re new to this whole veggie thing, and would like a good starting off point, I cannot say enough good things about Moosewood. Seriously, if you were to own just one vegetarian cookbook, this is the one. Every few years the publishers do some sort of update, making the rich-in-dairy dishes a little more heart friendly, but any edition of the book would be an excellent addition to your cookbook shelf. I’ve noticed that the pan gets very dry at this point, so I often find myself adding a little more oil so my seeds and onion don’t burn. 3) Add eggplant and salt. Cook, stirring from the bottom regularly, for 15 to 20 minutes — until the eggplant is soft. 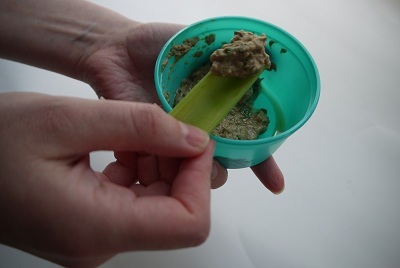 You might need to add a little water if the mixture is too dry. Cover the pan between stirrings. 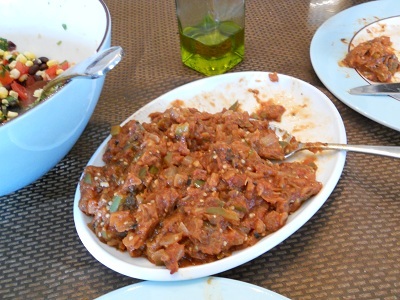 4) About 25 minutes in, the eggplant should have lost all will to behave like eggplant. It should be really mushy. At this point, stir in the frozen peas. Give it another 7 minutes or so, so that the peas cook up with the curry. 5) Serve the curry over rice, and top with fresh cilantro.